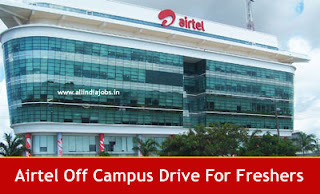 Airtel Off Campus 2018 Drive for freshers. BE / B.Tech / ME / M.Tech / Any graduate can apply for the job openings. Airtel is an Indian multinational telecommunications services company headquartered at New Delhi, India. It operates in 20 countries across South Asia, Africa, and the Channel Islands. Grab the great job opportunity to kick start your career as a fresher. Before going to apply for Airtel Off Campus 2018, read the job profile clearly to know the eligibility criteria, salary and selection process. Candidates who have completed the mentioned graduation can apply for jobs in Airtel. Airtel is the world’s third largest mobile telecommunications company and largest cellular service provider in India. Candidates willing to appear in the Airtel Off Campus 2018 Freshers Recruitment Drive are required to register online and must carry the copy of mandatory documents which are mentioned by the Airtel. We have also gathered latest Airtel Placement Papers and Airtel Test Pattern for better preparation. Registration is mandatory for participation. 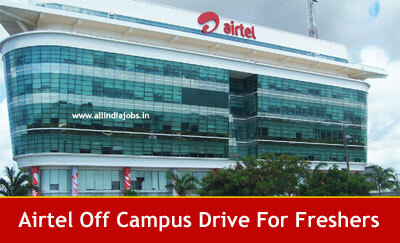 Airtel Off-Campus Registration link is given below. Airtel hires every year and recruit many candidates and offer them very good salary package it is one of the plus points to work in this company and their working environment. We always try to post all the current vacancies across India with all the job details. If any candidate has any problem then they can contact us through our email and we will try to respond you guys as soon as possible. All India Jobs have aimed to show you the right path so that you can get your dream job as early as possible. Candidates who have already appeared for Airtel Off Campus recruitment process in past 6 months are not eligible to attend. Candidates should have 60% and above in academics in 10th, 12th and graduation. Candidates should have no gaps in education. Candidates should have knowledge of fundamentals of computer hardware & networking. Candidates should not have any backlogs while joining. Contenders should have good speaking and reading skills. Applicants should be able to perform with a group of allowed team members. Aspirants must have good analytical and reasoning skills. The participants should have scored an aggregate of 60% & above in all academic courses from SSC Onwards. The candidate should be an Indian Citizen or should hold a PIO or CIO card in case of holding a passport of any other country. Who are interested in working with Airtel shouldn’t have any standing backlogs. It is mandatory to each and every candidate to clear backlogs at the time of appearing for Airtel Off Campus Selection Process. Selection of worthy and well talented candidates will be made on the basis of the performance in following rounds. Appointed candidates against the unoccupied positions of Airtel Off Campus Drive Vacancies will get an impressive amount of pay scale per month from Airtel company and along with that candidates will also allowable for other allowances as per company rules. Click on Apply Here link which is provided below. Complete the Airtel Application Form with the essential data. All the job aspirants should appear for interview in formal dress only. Practice Airtel Placement Papers and Syllabus. Aspirant will be required to sign 2 years service agreement. Prepare basics of your technical subjects. Must be willing to work in any of the service lines. Have a look on Airtel Test Pattern and refer it before going to interview. Candidates who want to attain other related details regarding Airtel Off Campus 2018 by visiting official site that is well stated here by the team of All India Jobs. For more latest job updates contenders can visit our site frequently and bookmark this page www.allindiajobs.in.